In my review, I found Grammarly affiliate program to be a high paying cost per action type affiliate program that pays you $0.20 per free sign up and a flat $20 for every successful upgrade. Grammarly referral program has a conversion rate of 20-30% which means you can easily earn $10-50 per day (approx. $1000/month)​. Are you interested in knowing more about Grammarly affiliate program? I hear that’s an yes and in this Grammarly affiliate program review, we will see how you can use it to earn more money from your blog on autopilot. Grammarly is one of the best grammar and punctuation checker tools out there. And it has a very lucrative affiliate as well which pays a decent referral income for every lead you send them. If you’re looking for the best cost per action (CPA) or pay per lead affiliate program for your blog that converts well, Grammarly referral program is your thing. So, let’s head over to our Grammarly affiliate program review and see how it can help you make money promoting it. In case you don’t know Grammarly is a proofreader, an online grammar and punctuation tool that sits right on your browser and detects and grammatical errors and punctuation mistakes in your writing. The best thing is, it checks over 400+ contextual errors that MS Word or other writing tools fail to detect. It is also a full-fledged plagiarism checker tool and detects traces of copied content from your essay/writing. Apart from the features mentioned above, here is how Grammarly is a great tool for your blogging arsenal. Vocabulary enhancement: Grammarly helps you improve your vocabulary by suggesting better word phrases and synonyms to the ones you have written. Style Checks: Grammarly doesn’t apply one rule for all. It checks your copy for errors and context based on the document it is. You can check a medical research paper, a business copy, an academic style paper, screenplay; you name it. Write from anywhere: Grammarly is not only an online tool, you can use it as an MS Word add in (if you use MS word), it also checks your articles directly from WordPress editing dashboard, email clients and even social media updates. Read my Grammarly review 2019 for more in-depth features of Grammarly. Now that you know what Grammarly is and how beneficial it can be for your readers and other bloggers, you are ready to promote Grammarly and earn money from its affiliate program. Let’s see how in our detailed Grammarly affiliate program review. How to make $200 per sale and up to $7500 per referral using WP Engine Affiliate program. Grammarly affiliate program is the best CPA based affiliate program for bloggers who are looking for high paying referral programs that pay you commissions for free sign ups. Grammarly affiliate program is a pay per lead affiliate program which means you get paid once anyone signs up for even the free program of Grammarly. If they upgrade (which is most likely given the benefits of Grammarly) you earn another big commission. One key aspect you have to note is, Grammarly pays you in more than one way for the same referral. This means you can earn commissions via many ways from every single sign up. 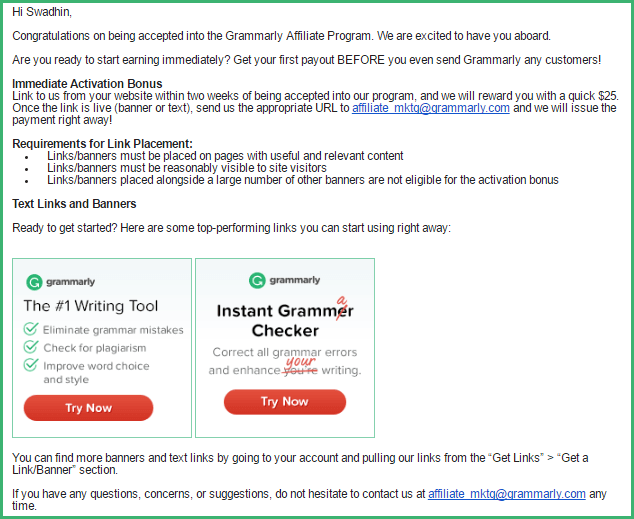 What is the affiliate commission per successful referral for Grammarly? $0.20 for every free signup. Massive $20 commission for every successful upgrade to premium Grammarly. Trust me upgrading is easy because once someone signs up for the free version, he will love it and look forward to using all of its features. If someone becomes an affiliate under your referral, you earn a passive 10% of all the referral income they make for the lifetime! If you make $2000 in a month as affiliate income, you get an additional $200 absolutely free bonus without doing anything extra. If you pass this level and make a referral income of $4000 per month, you get $400 bonus. If you make $8000 per month you get $800 as a bonus and so on. Grammarly gives you an instant $25 as soon as you are approved to become an affiliate of Grammarly. You can avail this amount by adding a Grammarly banner (premade in your affiliate dashboard) on your blog sidebar. Here is my welcome email sent by Grammarly when I joined them back in 2015 (this offer is still up and running). This is like getting paid even before sending any real customers to Grammarly. PRO TIP: Adding a banner for getting instant $25 bonus is not too much to ask for. Plus you can add your affiliate link to this banner, so anyone of your reader who clicks on this banner will entitle you another affiliate commission. To join as a Grammarly affiliate, follow the following steps. Click here to go to Grammarly Affiliate signup page. Fill Up your desired username and password and you are good to go. In the subsequent steps add your website details and payment information (direct bank transfer or via check) to complete the process. It takes no more than 5 minutes. Grammarly verifies and approves affiliates within 1-2 business days so be patience and wait for their welcome email. After that login to your affiliate dashboard and download a ready-made creative that suits your blog’s branding (they have over 120 creatives of different styles and branding). Place it on your blog with your affiliate or Grammarly referral link and reply back to the welcome email for getting your first $25 Grammarly affiliate activation bonus. Start promoting Grammarly (see how, below) to earn massive income from your blog. How To make Money By Promoting Grammarly As An Affiliate? Here are some fun and simple ways to promote Grammarly and earn affiliate income from your blog or elsewhere. Firstly, get your Grammarly referral link from ShareASale (Grammarly’s affiliate dashboard). It looks a bit ugly and doesn’t invite clicks (like any other affiliate URL). So cloak it using the pretty link plugin (free version is enough) which allows you to mask off that ugly URL into a good-looking and click-inviting link. For example, you can turn http://www.shareasale.com/r.cfm?b=223514&u=1051026&m=2674 into something cool-looking like this https://www.digitalgyd.com/grammarly. Place a banner on your blog preferably above the fold so that it grabs attention. Write out list posts where you can highlight its features (check my essential content creation tools article where Grammarly tops the list.) People landing on that page from Google or via internal links purchase Grammarly. Promote it underneath your all blog posts via the banners provided to you. One example is the banner below. You can place it at the end of your blog post. If you do not have a blog (learn how to start a blog and make money here) you can promote your link to friends and colleagues via email (add it to email signature) or social media updates. Grammarly has a cookie period of 90 days which means anyone who signs up for Grammarly within 90 days of clicking your link earns you a commission. 3 months is a long time to convert someone I must say. How Does Grammarly Pay Its Affiliates? Like I said, Grammarly pays out on the 20th-21st of each month. The minimum payout is $50 which is so easy to get your first payment (because of the $25 bonus amount). The payment is made via check or direct bank transfer which makes the whole process a lot easier and risk-free. With this, we wrap up the review of Grammarly affiliate program and wish you all the luck to start earning from it. Grammarly has a generous affiliate program and a little dedication can quickly make you over $1000-$2000 per month from Grammarly alone. P.S. If you have any doubt or want any further information about joining and promoting Grammarly, feel free to leave a comment below. P.P.S. Check out our WP Engine affiliate program review to learn how you can promote WP Engine and earn $200 commission per sale or check the master list of high paying affiliate programs to make money. I love using Grammarly. I honestly wouldn’t be able to blog or get research papers done without it. I didn’t know they had an affiliate program. I will have to look more into this. I am just now learning more about Grammarly and had no idea they had an affiliate program. Great post! I had never heard of grammarly before. I will definitely be checking it out! Thank you! Loved the way you have weaved this review and mentioned all the benefits of Grammarly. I know it’s a great tool – having used it and written a review about it long back on my blog, and I use it every single day in various places! Yes, the affiliate program is wonderful too, and I highly recommend it as well, especially for writers and bloggers. Grammarly is a tool that I could not blog without. I did not know that they have an affiliate program. Thanks for the useful post! Thanks for sharing. That’s awesome you’ve made so much money from being an affiliate. I know OF Grammarly but I’d never really thought about being an affiliate. I might have to look into it more! Very interesting post and very well organised! You have done a very good review of Grammarly affiliate program! You are very persistent in your promoting this program! I can really learn from your review. Thanks for sharing! Wishing you a lot of success for the future! Great review! This seems like a fantastic tool, and I signed up to be an affiliate. Hopefully I’m approved! :) Thanks for sharing. Do sign up and get paid to promote Sharon. Are you doing affiliate marketing on your blog? Very cool – never heard about this before!